Although built on the foundation of a thirteenth century defensive structure, this villa is a model of modern luxury. 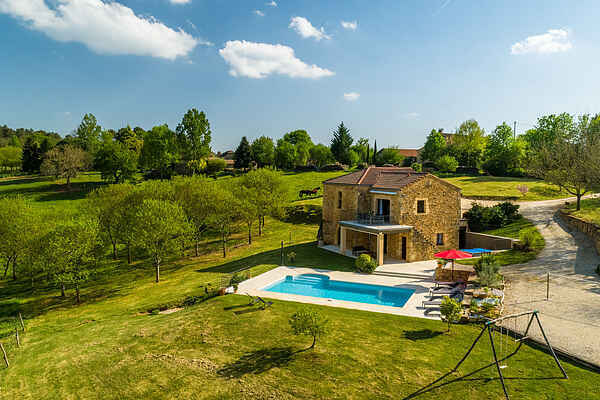 Located at four kilometers from Mazeyrolles you have a view of the forested hills. In the spacious living room you'll find a comfortable seating area and the kitchen is fully equipped. There isn't just a gorgeous pool at the house, there is also a ping pong table available for use. This place has a long history. The owner of the house likes to tell you about it. More history can be found, amongst other places, in Monpazier (12 km). This fortified town from the thirteenth century is one of the best preserved bastides in the Périgord. Another gorgeous example is Belvès (13 km), which is built op top of the rocks and looks down over the Nauze river valley. There is a beautiful swimming lake at Prats-du-Périgord (13 km). Have the children had enough of all the ancient towns? Then take them to the fantastic water park and aquarium in Le Bugue (31 km). Or take them on an adventure through the caves at Les Eyzies-de-Tayac-Sireuil (33 km). What an adventure!